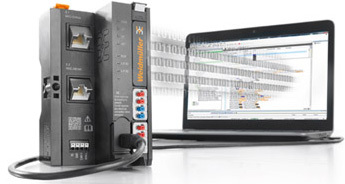 Weidmueller has introduced a stepper control module for its U-Remote family, which provides optionally CANopen connectivity. The UR20‑1SM‑50W‑6DI2DO-P module can be used to control a stepper motor. It provides configurable digital inputs and outputs. As part of the U-Remote family it provides optionally CANopen connectivity. The modular device can be engineered and programmed by means of the Codesys-based U‑Create Studio. 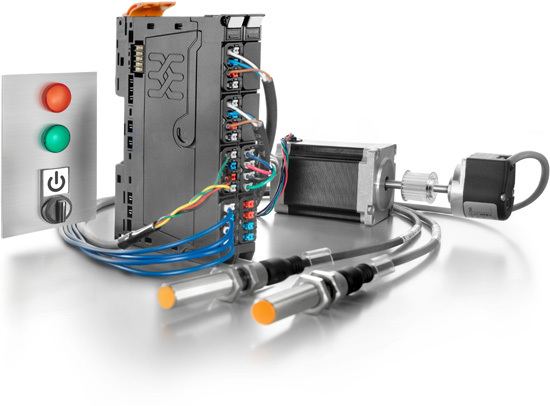 Stepper motors are a cost-effective solution for pick-and-place tasks, for handling systems, and placement machines, for positioning infeed axes or for robotics. They excel by virtue of a high torque even at low speeds and a high holding torque, which is maintained even in the de-energized state, explained Weidmueller. With dynamic acceleration and deceleration ramps, adjustable micro-steps and variable clock frequencies, the application spectrum can be extended. Against this background, it was a logical step for the German company to include a stepper motor module in its U‑Remote I/O family. The stepper control unit is designed as a normal module with a width of 23 mm. Due to its integrated power amplifier, it can directly control a 2‑phase stepper motor with a drive power of up to 50 W at the operating point of 2 A at 24 VDC. In addition, the module can record up to six binary control signals and control up to two actuators each with maximum 0,5 A. Inputs DI 4 and DI 5 can process encoder signals (AB mode); if required, an additional digital input can be parameterized as a zero track for incremental encoders with a reference mark. At each of the connectors 1 to 3, two sensors can be connected in two-wire or three-wire systems, e.g. limit switches or reference switches. Each channel is assigned its own status LED. The module electronics evaluates the input signals directly and supplies simultaneously the sensors from the input current path and the actuators from the output current path. The motor connected is supplied from an external power supply. Due to the 12‑VDC to 50‑VDC power supply range, the module achieves the flexibility for integration in different environments. Numerous operating parameters, such as maximum acceleration and soft start, travel and braking current, micro‑step and clock frequency settings or the Linear/Modulo operating mode selection, as well as special functions, such as jog, tip, or reference run, make the module suitable for a range of applications. This includes translational or rotational motion control, continuous, limited, time‑optimized or jerk‑optimized movements. The company offers a web-based and therefore platform-independent configuration tool. Preset basic functions simplify initial operation and direct signal processing in the module. Adjustable step sequences reduce the programming required in the controller. Additionally, the provider offers the U-Create Studio, a Codesys-based programming environment. It supports all programming languages defined according to IEC 61131‑3 (ST, IL, LD, FBS, AS). The integrated C/ C++ environment allows object‑oriented programming. The tool supports CANopen and provides an OPC UA server for machine-to-machine communication.